Research has shown that phototherapy can: increase circulation, accelerate tissue repair, decrease wrinkles, decrease inflammation, improve skin tone, texture and clarity, ease muscle and joint pain, stiffness, spasm and arthritis and kill acne bacteria, and much more. Specific wavelengths of light energy, when properly absorbed, up-regulates compromised cells. The light (photons) energy is absorbed by photoacceptors in the mitochondria and used to create adenosine triphosphate (ATP). The ATP produced then stimulates various metabolic processes which can result in the repair and regeneration of cell and tissue components. treated. These ions assist in firing the nerves thereby relieving pain. process. Destruction of the infection and clean up must occur before the healing process can take place. Invisible to the naked eye, IR light penetrates deeper than any other color in the spectrum. Combating the signs of aging and accelerates healing of wounds, cuts, and damage. Red light reaches deep layers of the skin, where it stimulates cellular repair and increases circulation to promote a more vibrant, youthful complexion. Red and IR light work synergistically to deliver optimal skin rejuvenation. Proven to have powerful anti-bacterial properties, blue light is used to treat mild to moderate acne. Blue light also helps to purify the skin, stabilize oil glands, and soothe inflammation. Brings vitality to dull complexions, Amber light reduces the appearance of redness, swelling and inflammation. This color of light is beneficial for rosacea and the treatment of burns, including sunburns. LED light Therapy session (Red and/or IR Light) specifically designed to address inflammation associated with trauma and/or an allergic reaction that causes discomfort with a focus on clients whonmxperience persistent problems such as joint and muscle discomfort. It is also used within 72 hours of any traumatic event including post-surgical interventions to reduce scarring and encourage normal tissue formation. 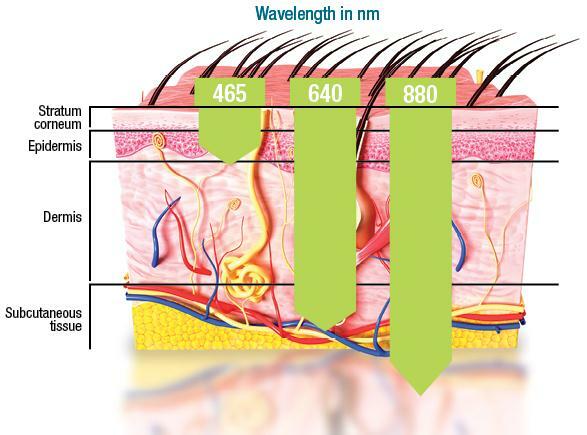 Infrared (IR) light (wavelength 800nm - 900nm) energy penetrates tissue at a greater depth than the blue and red light. Approximately 50% penetrates to 8cm and decreases to less than 1% at 20cm (NASA study). Infrared energy is known to heat tissue and its effects are well documented for therapeutic pain management. For cosmetic applications, IR stimulates the NaK+ pump which increases cell membrane permeability; facilitating equilibrium of cellular pH, while increasing nutritional absorption and elimination of waste byproducts. Red and Blue Light designed to repair damaged skin and significantly reduce the P. acnes, the bacteria responsible for causing inflammatory acne vulgaris. 15 minutes of Blue light first enters the sebaceous glands and singlet oxygen is created. Singlet oxygen then in turn kills the bacteria. Next, the client is exposed to 15 minutes of red light. This acne treatment aids in the healing process of the skin and prevents infection and scarring from occurring. Red and/or IR Light designed to re-hydrate the face, and increase collagen and elastin formation resulting in a reduction of fine lines and wrinkles. It aids in decreasing flaccidity, lifting sagging tissues and restoring skin tone and texture resulting in an overall improvement erasing years from the face. Ten treatments are recommended. Maintenance once a month or as needed can prolong the youthful appearance. Red and/or IR Light intended to improve discoloration caused by sun damage, chemical build-up, and chemical reactions from chemical peels, and excessive use of skin damaging products. 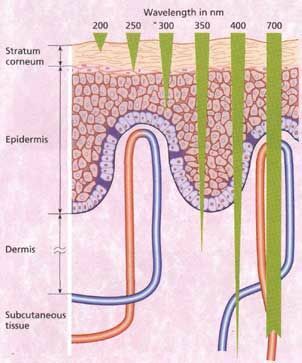 This process normalizes the melanin within the skin. The amount of treatments needed vary depending on the amount of damage to the skin, the thickness of the skin and the age of the client. Severe conditions such as Melasma may be best treated with a combination therapy of topical ointments such as hydroquinone and/or IPL and/or laser followed by Light Therapy. Scar Tissue - Red and/or IR Light uses powerful Infrared and red light to stimulate the reduction of fibrotic tissue and the replacement of normal tissue. Clients usually notice softening of scar tissue. They also notice flattening and widening of the scar. This is a normal sequence in scar reduction. With several more sessions the flat, wide scar will become thinner and remain flat. Some scars may appear to be resistant to this program (hypertrophic and/or keloid). If this is the case, a customized treatment protocol and/or additional treatment options may need to be considered. 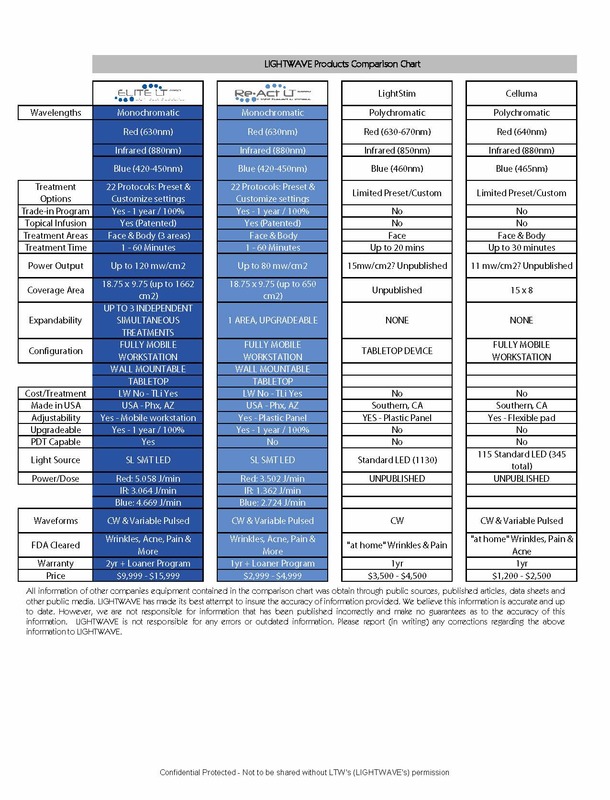 Lightwave LED systems are for Licensed Professionals and have 5 FDA Clearances. Over 60 peer-reviewed papers on tissue repair and pain control. Although most studies use low level lasers, more recent studies reveal very similar results with LED systems. The studies show overwhelming positive results.